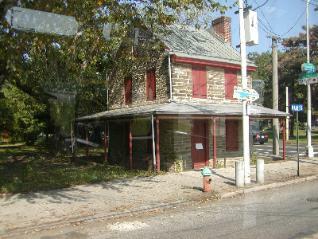 Built by Henry Paschall in 1766 The Blue Bell Inn , also know as Blue Bell Tavern was the location of a 1777 battle during the British occupation of Philadelphia. Blue Bell 's oldest section still stands at 7303 Woodland Avenue which at one time was the main stagecoach road between Philadelphia and the southern Colonies. 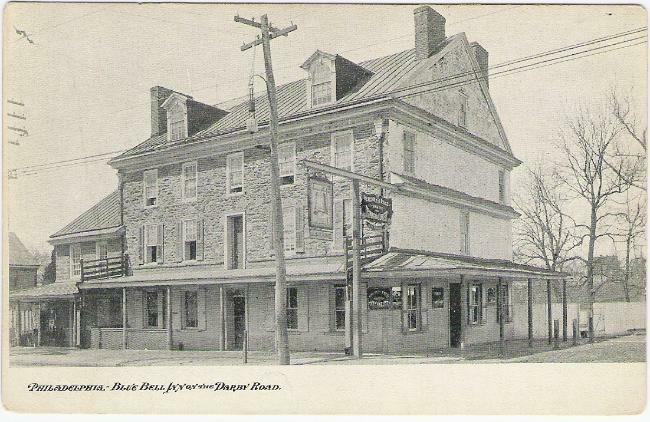 The Blue Bell Inn is an 18th-century, two-story tavern resting on the cusp of Southwest Philadelphia and the borough of Darby. Originally built by Henry Paschall in 1766, the Blue Bell was noted for its prominent location on Kings Highway (now called Main Street/Woodland Avenue), a popular stagecoach route into the city that sat in close proximity to Pennsylvania’s first water-driven grist mill. While traveling, George Washington and his soldiers frequented the Inn on several occasions, once on their way to the Battle of Brandywine. It also a witness site to the Washington Rochambeau Revolutionary Route(W3R). Where the French and American troops marched to Yorktown Virginia and the surrender of Cornwallis effectively ending the Revolutionary War,1781. Darby Road. When Fort Mifflin finally fell after a valiant defense,Lord Cornwallis sent some 2500 troops down the Darby Road to Chester. Accounts vary but one account says that when the British were passing the Blue Bell, a shot was fired from an upstairs window. The British rushed into the building and bayoneted 5 Americans on the stairs and took the remainder prisoners.